OTTAWA - Standing up for victims has clashed with the issue of public safety over the issue of warning gunfire. Justice Minister Rob Nicholson raised some eyebrows earlier this week by agreeing that firing shots over the heads of thugs and thieves may be considered reasonable under a proposed new law. Nicholson's musing prompted an angry exchange Thursday during question period. "What is he going to say to the family of the little girl crossing the road down the street when somebody fires a warning shot at somebody entering their property?" interim Liberal Leader Bob Rae demanded of the justice minister. "Does he not understand the danger of promoting vigilante justice in our society?" Nicholson fired back that Liberals can't figure out who are the real victims of crime. "If people are coming onto other people's property to set fire to their car, breaking into their house or attacking their family, those are the bad guys," said Nicholson. "Why can the Liberals not ever figure that out? How come they cannot figure out who the real victims are and stand up for them for a change?" The heated to-and-fro comes as the Conservative government is proposing to simplify and expand the Criminal Code sections that cover citizen's arrest, self defence and defence of property. During an appearance Tuesday at the House of Commons justice committee, Nicholson agreed with a question from Tory backbencher Brian Jean that firing a warning shot over the head of a repeat thief coming onto a rural property to steal an all-terrain vehicle would be "reasonable" under the circumstances. His comments were not welcomed by groups representing the legal profession and front-line police officers. 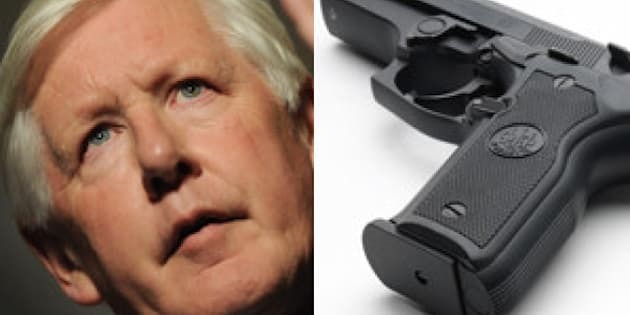 Eric Gottardi of the Canadian Bar Association said it was "particularly unfortunate" that Nicholson chose to endorse even the concept of warning shots — especially at a time when the government is expanding the notion of citizen's arrests. Jean, a Fort McMurray lawyer, said in an interview Thursday that brandishing a weapon was the kind of thing that happened when he was growing up in the rough northern Alberta resource city. But people who raised guns or fired them to ward off thieves often ended up before the courts, said the Tory MP, which usually found such use of force was not reasonable. "I think that is reasonable now, to be able to take a step beyond what you would expect others to do," said Jean. Representatives of the CBA and the Canadian Police Association told the justice committee Thursday that increasing the latitude for citizen's arrests could endanger the public. Jean, part of the Conservative majority on the committee, said the witnesses seemed to be saying "there was a duty so step away and allow people to steal things." "I don't think that duty exists. I don't think it's ever existed and I think it's ludicrous." Asked about Nicholson's comments on warning shots, Jean responded: "I actually think this legislation will clarify the law for Canadians and it'll make criminals stay away. I think criminals will take it more seriously now." While criminals might be deterred by the increased prospect of meeting a gun-toting property owner, Jean did not agree that gun owners will be emboldened by the very same law. "To go to the next step and take a weapon out and fire it is a big, big step for people, even in rural Alberta. People don't do that," said Jean. "They don't brandish weapons that are loaded at anybody. And I would suggest very, very few people would fire a weapon. And a lot fewer would fire at somebody trying to run away." Jean added that shooting over the head of a fleeing thief is out of bounds. "Firing a weapon at somebody that's trying to escape with a quad (ATV), that's not acceptable. That is not reasonable in the circumstances. And I can't imagine any judge in any province or territory in this country agreeing that would be a reasonable use of force or a reasonable defence of property."